(Photo: REUTERS / Mike Hutchings)Supporters cheer as they wait for opposition Democratic Alliance leader Helen Zille to address her party's final election rally in Johannesburg May 3, 2014. South Africa goes to the polls on May 7 in elections which are expected to keep President Jacob Zuma's African National Congress (ANC) in power. South Africans vote Wednesday in their fifth post-apartheid national election with the ruling African National Congress reeling under criticism for failing to deliver promises and being mired in corruption, but likely to romp to victory. 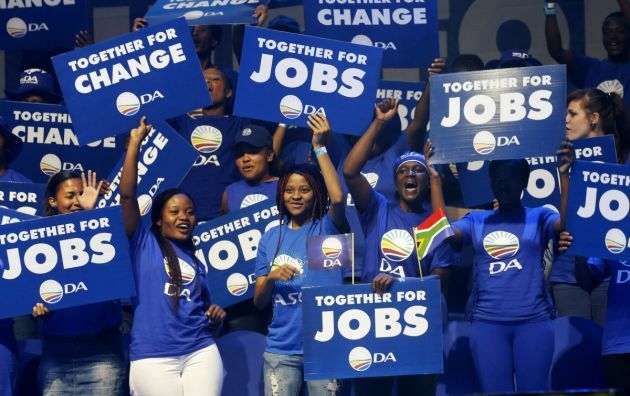 The main challengers to the party of President Jacob Zuma is the Democratic Alliance, which its opponents paint as a "white party" led by Helen Zille, but it also faces strong competition from the newly formed Economic Freedom Fighters, whose leader Julius Malema once headed the ANC Youth League. A total of 29 parties are contesting the election in the year that marks the 20th anniversary since apartheid officially ended and that South African and international freedom hero Nelson Mandela became president. In 1994 the ANC election the mainstream churches and their leaders that campaigned against the racist system of apartheid were seen as behind the policies of the ANC. In that election Nobel Peace Prize laureate Desmond Tutu who is now Archbishop Emeritus Desmond Tutu said he voted for the party of his old friend Mandela. Although many improvements were made for the majority of people after apartheid Tutu said this election he will not vote for the ANC. He told journalists on Wednesday that it is crucial to vote because there are people who died, who were imprisoned, and those who suffered in order for South African to be able to vote despite the colour of their skin. When asked which party he voted for, Tutu insisted that his vote is secret. Only last week Tutu, the former Anglican leader in Southern Africa, said he was "glad" that the former president was not around to witness the degeneration of the ANC, which is 102 years old, the oldest political party. "Don't be voting cattle. Think before you make that cross," Tutu. "I have sought to support a party that would be as close as possible to the sorts of things we would love to see. On the whole the ANC was that," he said, noting, "Have you noticed the past tense?" In the last election the ANC, which has won every poll since 1994, fell just short of a two-thirds majority in the number of votes cast. Zuma has mobilized the ANC and its ties to the State to put it into a seemingly unassailable position where a number of pre-election polls predicted it will still garner over 60 percent with the Democratic Alliance likely to edge up from 16 percent to more than 20 percent. Jacob Zuma started life as a humble cattle herder then he joined the struggle against white minority rule, earning prison time in Robben Island, and then became the fourth post-apartheid president after Nelson Mandela. He has brushed aside criticism on this fighting for survival as the six-times married president with four wives and many children and grandchildren has been accused of looting State coffers for his own family. He also brushed aside Tutu's criticism that he has helped bury the Mandela dream. "My understanding is that bishops and pastors are there to pray for those who go wrong, not to enter into political lives," Zuma told journalists Monday. "Should I now stand here and oppose Tutu and go toe-to-toe with Tutu? I don't think so." Frank Chikane, a former South African Council of Churches leader, prominent in the ANC has been quiet during the current election. Another church leader who was at the forefront of the struggle against apartheid is the Catholic Archbishop of Durban, South African Cardinal Wilfrid Fox Napier. He is now a strong critic of Zuma's governing. In an interview with Vatican Radio on Tuesday he noted there the risk of intimidation as people go to the polls and a widespread loyalty towards to the ruling party which is often seen as an embodiment of Nelson Mandela's ideals, and still stands for "liberation." Cardinal Napier said he hopes that "people will have matured enough to know that their vote is secret, their vote is precious, and that it is up to them to decide where they want to place that vote." He said voters, "should not be intimidated by people who tell them they know what vote they will or have cast." He added, "people should vote not so much for traditional reasons - I've always voted for this party - but rather for what is rather for what is going to serve the common good the most, or the most effectively." Barney Pityana, once an ally of slain anti-apartheid black consciousness leader Steve Biko, is now Rector of the Anglican College of the Transfiguration in Grahamstown in Eastern Cape province. A former staff member of the World Council of Churches, he wrote in the Mail and Guardian newspaper on May 2 that, "Democracy itself is in danger under a Zuma ANC." Pityana said, "A culture has now developed in which the party has collapsed its identity into that of the State. South Africa under the Zuma ANC has all the makings of a descent into an authoritarian one-party State." Zuma is unpopular with many ANC supporters, so some people wonder why the party of Mandela will still surge to victory and people will not vote en masse for an alternative. Some analysts point to countries such as India or Mozambique where the party that led the struggle for freedom has tended stay in power a long time. When a South African minister said that foreign embassies could only each have one election monitor in the May 7 election, some critics said they hope South Africa will not follow its neighbor Zimbabwe, which choses who will monitor elections.